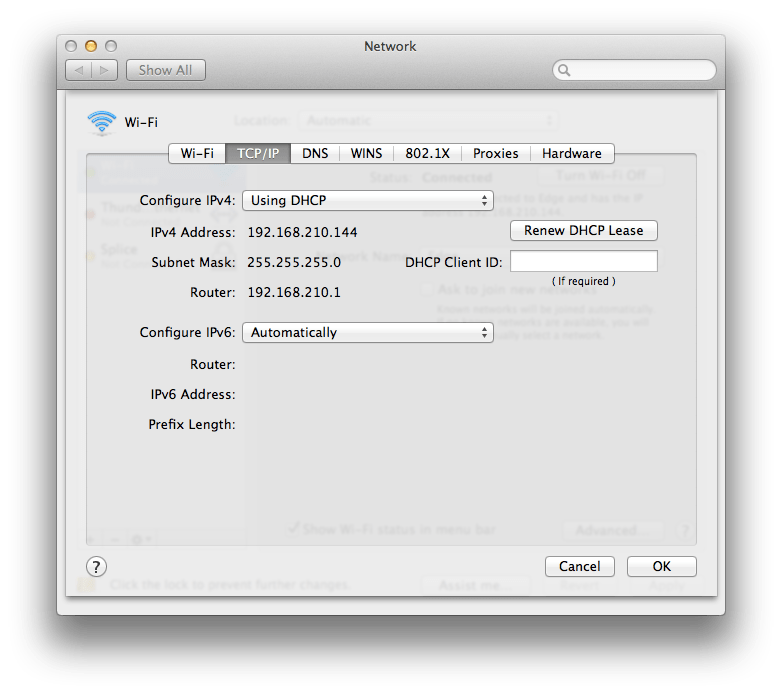 You can obtain a pretty decent amount of information about leases your OS X computer gets just by looking in the Network System Preference pane, for each interface. However, you can get a little lot more information, as with most things, from the command line. First, we’re going to take a look at en0 on our host and see what the MAC address is: ifconfig en0 ether Now, we can look in the /var/db/dhcpclient/leases directory to see a list of all of the leases we have running on our system. Based on the MAC address of our computer, we should see a file there that starts with the name of our interface and finishes with our MAC address. Let’s cat this file: cat en0-1\,84\:38\:35\:63\:87\:2e The output is similar to the following (a standard plist): <?xml version="1.0" encoding="UTF-8"?> <!DOCTYPE plist PUBLIC "-//Apple//DTD PLIST 1.0//EN" "http://www.apple.com/DTDs/PropertyList-1.0.dtd"> <plist version="1.0"> <dict> <key>IPAddress</key> <string>192.168.210.144</string> <key>LeaseLength</key> <integer>86400</integer> <key>LeaseStartDate</key> <date>2013-10-03T02:43:36Z</date> <key>PacketData</key> <data> AgEGAPSEH9QAAAAAAAAAAMCo0pAAAAAAAAAAAIQ4NWOHLgAAAAAAAAAAAAAAAAAAAAAA AAAAAAAAAAAAAAAAAAAAAAAAAAAAAAAAAAAAAAAAAAAAAAAAAAAAAAAAAAAAAAAAAAAA AAAAAAAAAAAAAAAAAAAAAAAAAAAAAAAAAAAAAAAAAAAAAAAAAAAAAAAAAAAAAAAAAAAA AAAAAAAAAAAAAAAAAAAAAAAAAAAAAAAAAAAAAAAAAAAAAAAAAAAAAAAAAAAAAAAAAAAA AAAAAAAAAAAAAAAAAAAAAAAAAAAAAAAAAAAAAAAAAABjglNjNQEFNgTAqNIBAQT///8A MwQAAVGAAwTAqNIBBggEAgICzg0cDP8= </data> <key>RouterHardwareAddress</key> <data> ABfFg9DO </data> <key>RouterIPAddress</key> <string>192.168.210.1</string> </dict> </plist> This shows us the amount of time our lease is valid for, when the lease what provided to us, what IP was provided and the IP of our router. We can then key off of that information as needed (e.g. for other scripts/tools). Use Xsan Admin to stop the volumes (see below). In Xsan Admin select Overview. In the lower right corner, click the gear icon and choose “Edit SAN properties”. Select the Metadata Network that you want to use. Note: If all controllers and clients are not on the same subnet on each network, the Save button will be dimmed. Adjust the clients and controllers so they are on the same subnets. This typically works great; except the fact that the article has been retired and in Xsan 3 the Save button never actually gets undimmed. Therefore, while I hate changing network interfaces in Xsan I do find that in 10.8 and higher, I end up needing to do so by editing the config files. To get started, first shut down your backup metadata controller, so in case everything goes haywire you have a back out plan. Then open config.plist from /Library/Preferences/Xsan in your favorite text editor and locate the metadataNetwork key as follows: <key>metadataNetwork</key> <string>10.0.0.0/24</string> In this case we’re going to switch from our 10.0.0.0 network to our 192.168.0.0 network (note that this is a .0 with a CIDR and not the actual IP address): <key>metadataNetwork</key> <string>10.1.10.0/24</string> Once you’ve made your change, edit fsnameservers. The file will initially have data that looks like the following (provided our Metadata Controllers are 10.0.0.1 and 10.0.0.2): 10.0.0.1 10.0.0.2 Assuming the systems have the same final octet the resulting changes would be as follows (note that these have no XML structure and are just a list of numbers separated by carriage returns): 192.168.0.1 192.168.0.2 Save the files and reboot the host. Provided that everything works on both network interfaces, the volume should automatically start upon reboot. If the volume starts and you can mount it then repeat the same process on the backup. The metadata controller will initially indicate that it cannot stat the volume settings on the backup when the backup is restarted. Don’t worry about that, just make the changes and reboot the backup. Once rebooted, check cvadmin and verify that all volumes are activated on both hosts. If they are, then you’re good on the controllers (unless you have a third controller and need to do this process on it as well). Clients sometimes need to get removed from the SAN and readded. If this is the case, then force remove them from Xsan Admin (unless of course, it allows you to do so gracefully), Disable Xsan from the Xsan System Preference pane and then rm the contents of /Library/Preferences/Xsan. Provided everything removes properly restart (or launchctl unload com.apple.xsan and launchctl start com.apple.xsan.plist) and then readd the client from Xsan Admin. The clients should be the easy part of this whole process. Overall, it’s a pretty painless process. If you can get the Save button in the Settings screen for the SAN per Apple’s instructions then that’s preferred as it’s less work; however, I have only seen that Save button selectable in Xsan 2 and below. Good luck! PlistCheck will be made available on the Apps page as well.